Exclusive shock report - The entire Brexit debate has been focused on one thing for months. The issue is the movement of goods across a small, open border on the island of Ireland. On that issue has the Brexit negotiation been centred. From that one issue, the most significant of the many surrenders given by Mrs May and her Remainer civil servants have been based. The EU says it is essential in order to “protect the integrity of the Single Market”. REALLY? Brexit Facts4EU.Org has analysed the official trade figures. Guess how big the threat to the EU’s precious Single Market really is? This is the tiny proportion of all goods entering the EU which is represented by the goods crossing the border from Northern Ireland to the Republic. Is the EU’s Single Market really threatened by imports into its north-western tip, of such a tiny magnitude? The percentage is so small we couldn’t even show it in a bar chart – and it only barely shows in a pie chart. The Irish Revenue service says it carries out routine checks on just 1% of goods crossing its border. So we’re talking about 1% of border checks on 0.15% of the EU’s total imports, which equates to checks on 0.0015% of the EU’s imports. 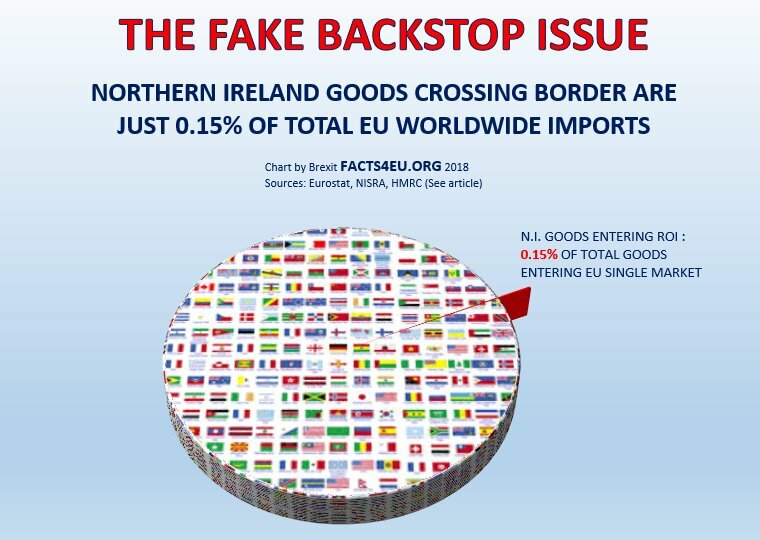 This means that the entire madness of the Backstop, and a vast amount of the Withdrawal Agreement, and all the delays, debates, and attempts to keep the UK in the EU, are because of checks on 0.0015% of the total amount of goods entering the Single Market. We really, really, really couldn’t make this up. And what’s the maddest thing of all? The solutions were all there two years ago. It’s a non-problem. Both HMRC and the Irish Revenue were working on the details of the implementation two years ago, before they were stopped from continuing. We know we will receive emails from readers asking why they weren’t told about this. It’s a good question. How is it possible that the entire Brexit process has been derailed by such an infinitesimally small issue? For an answer to that, we suggest writing to The Prime Minister, 10 Downing Street, London SW1. Readers might also wish to write to President Jean-Claude Juncker – whom none of you elected – to ask him why the EU has made Brexit so difficult over something they could have waived, for the sake of peace on the island of Ireland. There is of course a bigger answer to the fundamental question about the above facts. Given the bullying behaviour by the EU in the last two and a half years, it’s time to get serious about a positive alternative. A managed exit on 29 March is still perfectly possible. It involves trading on the same basis as most of the rest of the World. It involves a few side deals on matters such as aviation, citizens’ rights, and a range of technical measures. But it’s all possible. We call this "WTO - The Way To Go" or simply "Go WTO". Not only is it possible, we feel it would be a breath of fresh air for the British people. We would have certainty. Businesses could finally make their preparations and we would truly exit the EU – as the majority decided in the Referendum – on 29 March this year. We would have taken back control. Now wouldn’t that be marvellous?